O (Observation): First, some background. At this point in the history of Israel, the kingdom has been split into two. The northern kingdom is called Judah. The southern kingdom is called Israel. At this point in time, Jehoshaphat is the king of Judah, the northern kingdom, whereas Ahab is the king of Israel, the southern kingdom. The prophet Micaiah, is the one true prophet left in their time. Up to this point, King Ahab has really only been using the prophets that tell him what he wants to hear (and there are a lot of them…over 400!). Seems like Ahab knew of Micaiah, but chose to ignore his words and wisdom, because the vision he regularly received was that of Ahab’s demise. Micaiah declared a vision that would lead to Israel being scattered and worse off than if they didn’t try to re-gain their Syrian territory. But Ahab only took the advice he wanted (from the false prophets), going so far as to imprison Micaiah for seeing this vision of Israel’s destruction. But as Old Testament prophets go, they simply are called to pass on a message to the community…who then chooses to do with it what they want. A (Application): To whom do you listen? Who have you invited into your life to help keep you on the straight and narrow? Who speaks wisdom into your life and helps to correct you when you get off track? Unfortunately, many of us choose Facebook for the role of prophet. Facebook has turned into an echo chamber of sorts, where we only engage the voices and folks with whom we agree. (Sound like King Ahab, anyone?) We share and hear only the stuff with which we agree. We tend to ignore or impune the voices we don’t like. We lump them into categories: ignorant, stupid, misguided, uninformed, less faithful, etc. We all need prophets in our lives; we all need voices that contradict our own, lest we become complacent in our religious and ideological views to the point that we shut down conversation completely. My fear is that listening will become less important and speaking our minds will become too important. When this happens to leaders (political, religious, others), they begin to rule by fiat, rather than by the Spirit. 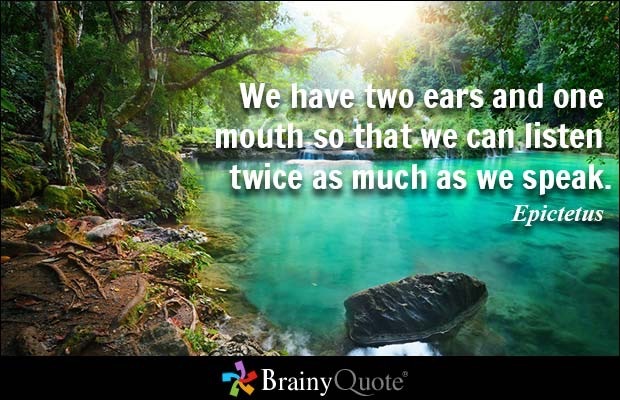 Let us all become people willing to listen twice as much as we speak. May we take on the voices that contradict us and hear where other people are rooting their thoughts and opinions. May we lift it all up to God, and may we act on God’s voice to bring us to peace here and in the hereafter. P (Prayer): Lord, help us listen and speak with wisdom. Amen. This entry was posted in Digging Daily, Growing Leaders and tagged Facebook, Listen, Prophet, Speak. Bookmark the permalink.